Our studio espresso machine has died. After seven years and 8000 shots, it was declared DOA yesterday afternoon. If you donate towards a new one, I will donate blood platelets to children with leukemia. “A $2,000 coffee maker … are you out of your caffeinated mind?? ?” — he just doesn’t understand. I have donated platelets in the past. It’s an extremely satisfying feeling, there’s no doubt. Once, when a friend of mine heard that I've donated platelets, she was so effusive in thanking me that she totally choked me up. She actually thanked me for saving her daughter’s life. It’s a beautiful feeling to give to such an amazing cause. I’ve tried to invite friends to donate with me, and I’ve noticed that there are a lot of reasons for not going. Some are willing but get disqualified, some are understandably terrified, some are busy, but some of you have no excuse. So here’s my plan; I am asking you to donate to our studio espresso machine drive. If you do, I will donate platelets in your honor. We will give you props here and on my Facebook page, the UCLA Blood and Platelet Center Facebook page, and put your generous name on an engraved plaque, glued to the amazing machine for all to see. So, let’s do this. You get your name on our new machine, and the satisfaction of being part of a great thing – the gift of life to a child. 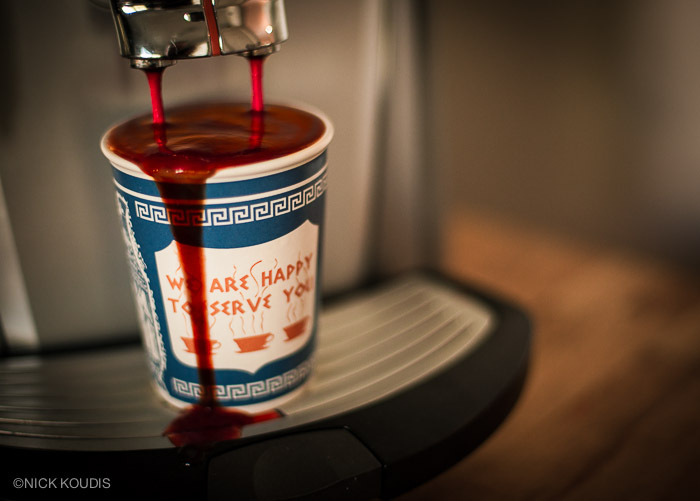 And I get my life’s blood with steamed milk. Coffee runs through my veins. This tattoo of NYC’s iconic Anthora cup on my arm should prove it to you. You guys are amazing! We saved five babies today. Let’s keep it up. UPDATE: Donations are closed. My real goal here was to create awareness and get YOU to donate platelets! It’s easy and the GREAT team at UCLA are incredible. And so are you. Call your local blood center now.